A study that looked at mainstreaming genetic counselling for ovarian cancer to support screening programmes in Malaysia was presented at the ESMO Asia 2017 Congress. The preliminary results of the MaGiC study show that most patients counselled by a well-trained but not necessarily an expert in genetics were satisfied or just as satisfied with their experience as compared to those being counselled by a genetic counsellor or clinical geneticist. One in nine ovarian cancer patients carries the BRCA1 or BRCA2 (breast cancer gene 1 or 2) mutation and four in 10 carriers do not have a family history of breast or ovarian cancer. Knowing one's BRCA status may indicate how one may respond to certain therapies or the level of risk to develop certain cancers. "In the past, genetic testing in ovarian cancer was limited to a small number of patients with the aim of identifying relatives at risk," said Dr Soo Chin Lee, Senior Consultant, National University Cancer Institute, Singapore, commenting on the study. "Now that there is a drug to treat cancer patients with BRCA mutations, genetic counselling and testing is recommended for all patients with epithelial ovarian cancer. This has increased the number of patients who qualify for testing and thus specialised centres have become overloaded." 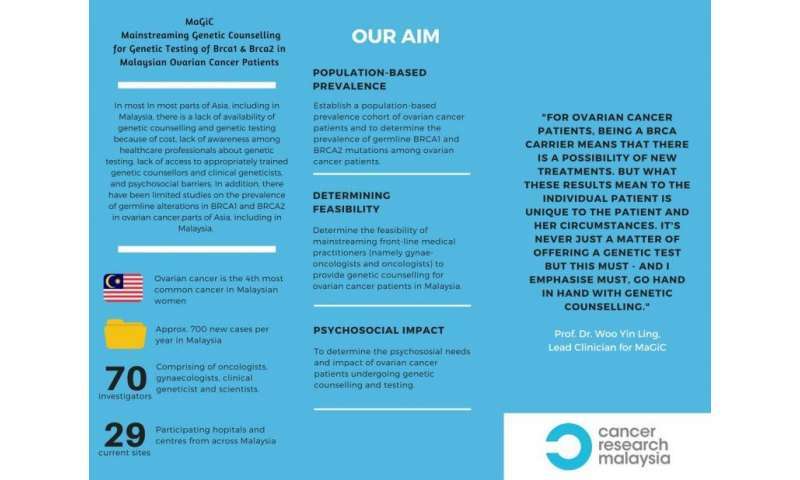 The MaGiC study was designed to assess the prevalence of germline BRCA1 and BRCA2 mutations among ovarian cancer patients; determine the feasibility of mainstreaming genetic testing and counselling at local hospitals; examine the psychosocial impact of genetic testing in Malaysia. 800 ovarian cancer patients are to be recruited over a two-year period. Basic genetic counselling workshops have been held for 70 non-genetic clinicians from 29 hospitals across Malaysia. According to the study protocol, patients are allocated to counselling by a trained non-genetic clinician in their local hospital in a clinical programme led by Professor Yin Ling Woo, MaGiC's lead clinician, or to counselling by a genetic counsellor or clinical geneticist in a programme with Professor Meow Keong Thong, lead clinical geneticist at specialised centres in Kuala Lumpur. All blood samples were analyzed for BRCA mutations by Cancer Research Malaysia, coordinated by diagnostic lead Dr Joanna Lim. Patients received pre-test counselling, followed by test results and post-test counselling. After both pre- and post-test counselling, they are interviewed by a researcher over the telephone to assess the feasibility and the psychosocial impact of the experience. One year into the study, 248 patients have been recruited, of whom 208 received genetic testing and 13% (27) had BRCA mutations, which is similar to that found in other populations. "Screening for BRCA1 and BRCA2 mutations and providing genetic counselling in local hospitals could help identify mutation carriers who may benefit from risk management and targeted treatment," said lead author Ms Sook-Yee Yoon, genetic counsellor, Cancer Research Malaysia, Subang Jaya, Malaysia. (3,4) "In Malaysia, BRCA genetic testing and counselling is only available at specialised centres in Kuala Lumpur but most people live outside the capital: patients seem to prefer local appointments, so if they are referred to another centre for genetic counselling, they seem less likely to attend. " Preliminary results show that the answers to the psychosocial surveys were similar between the two groups. Most patients were satisfied with their counselling experience, felt informed about their choices, and found it easy to decide to go ahead with genetic testing. In terms of feasibility, patients in the local and specialised counselling arms were equally satisfied or very satisfied with the counselling they received. The local counselling arm has been recruiting patients more quickly than the specialised arm. "Cancer is still a taboo subject in Malaysia and there is a fatalistic attitude to hereditary conditions," continued Yoon. 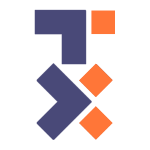 "Genetic information can cause conflict in families and the data we are collecting on the psychosocial impact of genetic testing will provide insights into the psychosocial challenges. With this knowledge, we can focus on interventions to overcome these challenges." "Mainstreaming genetic testing and counselling to local hospitals is a strategy to cope with this increased volume of patients," continued Lee. "This is ideal for a large country like Malaysia where specialised centres are concentrated in the capital yet the majority of the population live elsewhere. Lee said: "The preliminary results of the study show that moving the genetic counselling process to the community is feasible and could be rolled out across Malaysia. It also is a model for other countries like Singapore to follow." Your email address is used only to let the recipient know who sent the email. Neither your address nor the recipient's address will be used for any other purpose. The information you enter will appear in your e-mail message and is not retained by Medical Xpress in any form.